"I can't afford to contribute to my retirement account right now; maybe some day." I hear this a lot, especially from people early in their careers. Maybe that's your situation. You may be saddled with student debt, saving for short-term goals like a car, or a down payment on a home. Contributing to a 401(k) would be nice, but it's just not going to happen right now. But it really is worthwhile to save whatever you can afford to, even if it doesn't seem like much. I think of money invested in your 20s and 30s as superdollars: with several decades to compound, this money has incredible growth potential. One dollar compounding at 6% per year will be worth $10.30 in 40 years. One dollar compounding at 6% will only be worth a third of that, $3.20, after 20 years. Put simply, the younger you are when you start investing, the more time your money has to grow and the less money you will need to save to reach your goal. By contrast, the longer you wait, the less "super" your dollars get. The money in your retirement savings account is made up of principal (the money you contribute from your paycheck) and the interest earned on that principal. 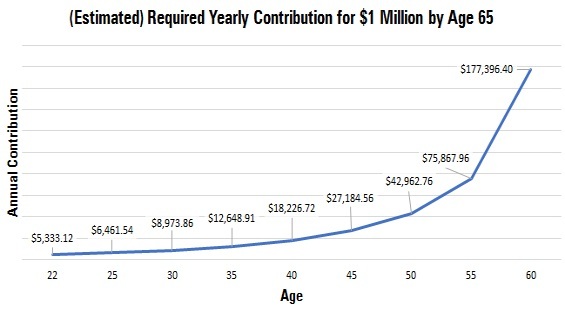 If you start contributing at age 25 rather than age 45, you have more opportunities to make contributions, meaning your individual contributions don't need to be as large to amass the same amount come retirement. That part's pretty obvious. But there are also more periods over which your principal will compound, which means the money you contribute will earn more interest--interest on top of interest. That's why these early contributions are superdollars--these early dollars you invested are worth a lot more come retirement than later contributions are. When I first started contributing to my 401(k), I was in my 20s, and I could barely afford to save any money. But I'm very glad I did because these early contributions are my superdollars today. I started by contributing 7% of my salary, which would allow me to get the maximum employer match. That only amounted to about $100 per paycheck, or $2,450 per year. Luckily, I was able to increase my yearly contribution by 50% by taking advantage of my employer match. Here's how the match math worked for me. My employer matched contributions up to 7% at $0.50 on the dollar, which meant that my company contributed an additional $1,225 per year to my account. Adding the employer match brought my overall contribution to a whopping $3,675 per year. If I had contributed less than 7%, however, my company would have only matched up to the amount I contributed. Let's say I had decided to contribute 5% instead of 7%. I would have contributed $1,750 per year (about $68 per paycheck), and my employer would contribute $875 per year. It would have been a total of $2,625. Not bad, but I would urge you to contribute at least up to the percentage that allows you to get the highest employer contribution possible if it's not too big a stretch. Of course, you could opt to contribute much more than that, up to a maximum of $18,500 in 2018. If your budget is really tight like mine was, though, just do the best you can. I guarantee you'll be surprised at how much your superdollars will be worth someday.